Andrew works exclusively with egg yolk and pigment on traditional grounds, either as egg tempera or watercolour. Winner of the 2016 Royal Watercolour Society Exhibitions Award and the 2016 David Simon Contemporary Art Prize. He has exhibited at the Royal Academy in successive years, the Royal West of England Academy and numerous shows at the Mall Galleries, including RI, RSMA, NEAC, RBA, Sunday Times Watercolour and Lynn Painter Stainers Prize. Andrew was born in 1963 and educated at Kingswood School, Bath and later trained at Middlesex Polytechnic. He lives in Corsham with his children and his partner, Celia, and their two dogs. He works out of his studio at Foxham in Wiltshire. Winner of the 2016 Royal Watercolour Society Exhibitions Award and the 2016 David Simon Contemporary Art Prize. He has exhibited at the Royal Academy in successive years, the Royal West of England Academy and numerous shows at the Mall Galleries, including RI, RSMA, NEAC, RBA, Sunday Times Watercolour and Lynn Painter Stainers Prize. He is also an executive committee member of the Bath Society Of Artists. His work is generated from a synthesis of momentary impulses based in memories and direct impressions of the landscape. The source of his inspiration is the creative spirit manifested in the fabric of nature and as such there is a conversation being had between inner and outer worlds as the work process evolves. Paintings are often conceived in a moment and then take time to unfold. In using raw pigments combined with a variety of mediums he achieves a direct connection to the elemental quality of landscape. Working in this way can be explosively fast and at other times meticulously analytical. 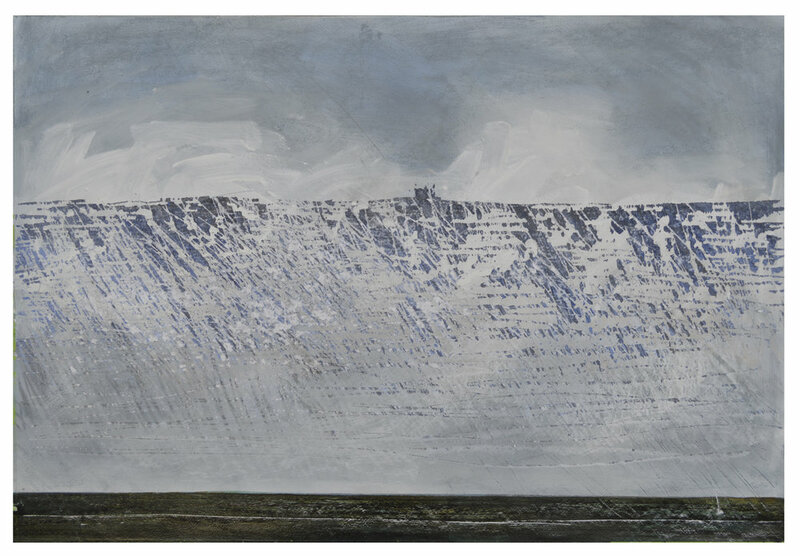 "Andrew Lansley's egg tempera landscapes show a distinct presence in the British tradition of draughtsmanly painting. Subjects and colours seek outer edges: a small boat abandoned in a sea of grasses; refulgent fields and trees ghostly under solar eclipse; last leaves wind shredded above richer browns of hillside ferns. Lansley's art opens painting to music's dimension of time." Jerrold Northrop Moore - author of The Green Fuse: Pastoral Vision in English Art 1820-2000, and biographer of Elgar, Vaughan Williams and F.L Griggs. Jerrold Northrop Moore wrote The Green Fuse - a history of the tradition of visionary English landscape painting. He is also the official biographer of Elgar. Each of the artists included in my history of English visionary painting The Green Fuse, has contributed something distinguished to the tradition founded by Samuel Palmer and now entering its third century. Palmer's distinction from his own magister Blake was to take visionary drawing and painting to fill the landscapes of an entire career. The ongoing tradition has included the master of romantic etching F.L. Griggs, Paul Nash, Graham Sutherland, John Piper and the Ruralists. Had I been writing the book today, I would've made another chapter onwards to include the artwork of Andrew Lansley. While still a student, Lansley discerned for himself Palmer's seldom noticed use of egg tempera to light a dark painting such as Coming from Evening Church with the glimpse of vision. And he, as much is any Palmer disciple over the centuries, has expanded the use of tempera to fill all his art. With this in mind, one traces the excursion of Lansley's subjects from town through country holding the old house, farm machine or upturned boat in long grass within sight of water and storm towards abstraction. I greatly look forward to this young artist's enlarging journeys through earth and water and elements of lighter gravity." Andrew is also the owner of WalkAndDrawBath, which aims to facilitate others' creative process. Commissioning clients include King & McGaw, John Lewis Partnership, The Royal United Hospital, Bath Building Society, The Roman Baths, Creativity Works, Bath Artists Studios, Homewood Park Spa Hotel and Kingswood Prep School. Through the vehicle of WalkAndDrawBath Andrew connects with a wide range of client groups and individuals. He hosts events and workshops with a variety of organisations, including Bath Artists Studios, Creativity Works, The American Museum and The Holburne Museum.